With the right support, at the right time, anything is possible. With the right support, at the right time, anything is possible. Aliesha and Teagan Newman are just like all sisters. They fight over time in the bathroom, they tease each other and are fiercely competitive. Their rooms look just like most teenager’s rooms. They are messy and full of a collection of fashion runners and pictures on the walls. But their rooms are a little different to most. The sisters have been living in a Kids Under Cover studio for the past three years. The girls had their world turned upside down in 2009 when mum Noraine started caring for two siblings, aged just three and one year old at the time. The siblings had been removed from their father by The Department of Health and Human Services after the death of their mother. Three years later Noraine had a 10-day old baby placed in her care also. Life had been extremely difficult and almost unbearable for the girls since their Mum took on the care of the three younger extended family members. 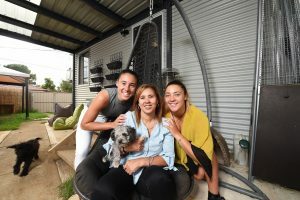 Prior to receiving their studio, Aliesha was sleeping in the loungeroom of the family’s small three-bedroom Office of Housing home with her mum Noraine and the baby. With three small children, all under ten years of age, Aliesha then aged 19 and Teagan 17, the house was exploding and tensions were sky high. The girls were fed up, couldn’t concentrate and had no sense of belonging in what had become a chaotic environment. “We had six people living in a three-bedroom house, with one bathroom. I was sleeping in the loungeroom with Aliesha and the baby. Teagan had her own room, and the other two children each had a room,” remembers Noraine. Overcrowding creates a lack of space and privacy. Young people living in severely overcrowded homes often have no space to study, no privacy or stability. Overcrowding is a major contributor to youth homelessness. Many young people are forced out of home prematurely because of an overcrowded living situation, often leading to couch-surfing which can trigger the beginning of years of homelessness. The house was in a constant state of chaos, it was noisy all the time, there was never enough room, even to just move around, and there was absolutely no privacy for Noraine or Aliesha. The addition of the children to the household caused significant overcrowding in the small home. The chaotic conditions of the home led to high levels of conflict a great deal of the time. Two of the young children have behavioural issues arising from trauma experienced when they were only young, along with attention deficit hyperactivity disorder (ADHD). One had also been diagnosed with generalised anxiety disorder. Most of Noraine’s time was spent dealing with their behavioural issues which included angry and violent outbursts. They often destroyed the furniture and stole belongings from Aliesha and Teagan. At the time of applying for the studio, Teagan was in year 12. She was often forced to study at school or at the library because of the difficulties in finding a peaceful space at home in which she could concentrate. Both Aliesha and Teagan were talented sportswomen who often represented their state in their respective sports but their home environment was beginning to have a negative impact psychologically on their sporting performance. “We had reached crisis point, I thought Aliesha and Teagan might leave. The studio gave us light at the end of the tunnel,” mum Noraine remembers. Since moving into their Kids Under Cover studio, the girls have excelled. These days things are a whole lot better. Teagan successfully passed year 12 and went on to study dental nursing and both girls are now working full time. No easy feat considering the upheaval injected into their world all those years ago. Most excitingly, both are on the verge of making it big in their respective chosen sports. An opportunity assisted by having the right support, at the right time. “My friend actually barracks for Melbourne, so we decided to go along for a laugh,” says Aliesha. “Then the coach asked me to come back and have a kick, and well, the rest is history,” laughs Aliesha. And for Teagan, success has come just as quickly having made extraordinarily fast progress, the 19-year-old is now succeeding as a weightlifter with the Hawthorn Weightlifting Club, competing within the Junior League. Just over a year ago Teagan decided to take up the sport to strengthen her athletics career in which she excelled at the discus and hammer throw. Since taking up the sport Teagan competed at the 2016 National Championships finishing in fourth place in her division. Teagan then went on to represent Victoria earlier this year taking out the 69-75kg class after lifting 137kg! Determined to do the best she can Teagan made the trip to the Gold Coast in September 2017 having earned a place on the Australian team at the Commonwealth Oceania Junior Championships. So, how did she go? “Oh, I got a couple of medals.” she quietly tells us. Teagan came home from the championships with two silver medals, and an eye on the 2020 Olympics in Tokyo. But first, she has the Junior World Championships in 2018 to conquer. And when asked about her career as a dental nurse? Teagan says, “I just can’t fit it in. I train six times a week and when I’m not training I’m either at the gym or competing. 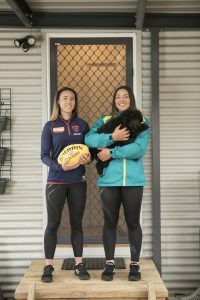 For Teagan, she is not fazed by her big sister’s pending fame on the footy field “while she might be playing in the AFLW, I plan on winning gold at the Olympics,” she laughs. And that she does. 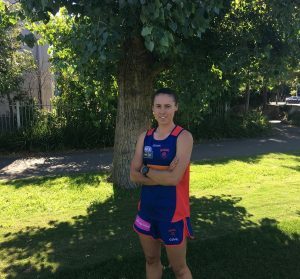 Aliesha is a little pocket rocket on the footy field. Aliesha explains “I had never played Aussie rules footy before, Mum always said I was “too small” so steered me towards soccer. I played soccer for seven years and Teagan and I have always been involved with athletics and other team sports. I know a lot about footy, but hadn’t played a lot, so that is my focus now,” says Aliesha. Since the arrival of the studio in late 2015, the girl’s general happiness has improved and having their own space away from the chaos of the family home enabled them to remain connected to family and follow their dreams, whilst giving their mum some peace of mind. Before the installation of the studio never did Noraine think she would be standing on the sidelines cheering her eldest daughter on as she represented the Melbourne Football Club. Nor did she think she would one day be sitting in the stands watching Teagan represent Australia in weightlifting. “I am beyond proud of the girls.” beams Noraine. As for the future. Well, this dynamic duo proves, with the right support, at the right time, anything is possible.